We had been informed about this little gem before by Tina’s mum. 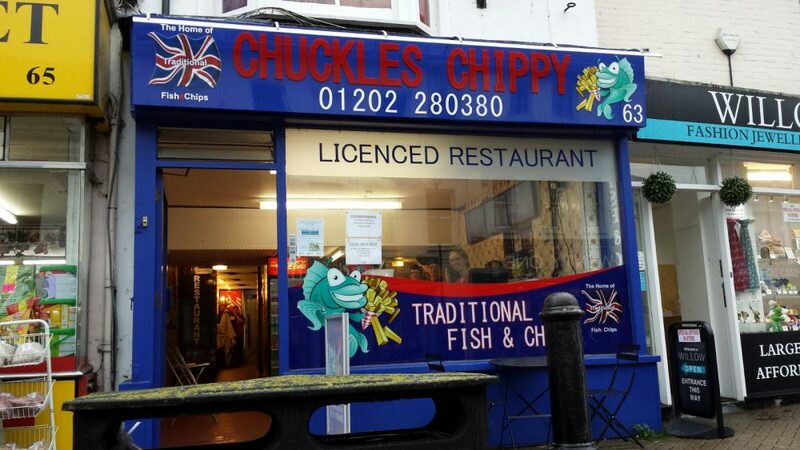 Having lived in the Brighton and Hove area most of our lives we had experienced many chippies. Some tremendous but many the fall way below par. Why not have a read of what we thought here. Christchurch is a beautiful little place; we were pre-warned about how good this little chippie was so finding it was never really an issue. The only thing we found was that the name had changed to had we not been told it was opposite Store 21 we may have discarded it as no longer being there. Parking around there isn’t the easiest from what we found. You have a few car parks down by the harbour, well when I say harbour it’s a mini marina with tiny teenie boats. However, if you have a car that’s exempt from road tax, then you may be able to park for free. I didn’t know but dived into the fish that we had ordered, and you could very quickly tell that it was Skinless, that’s right Skinless!!! I had never had a skinless piece of fish before so this was undoubtedly going to be a treat. The only downfall with this, and its such a minor thing and that’s when you cut into the batter the fish tends to fall away from it. But as I said that’s such a minor fault! Lee decided to have Curry sauce with his, this was only because it came with a sauce but we will cover that in with the price later on. 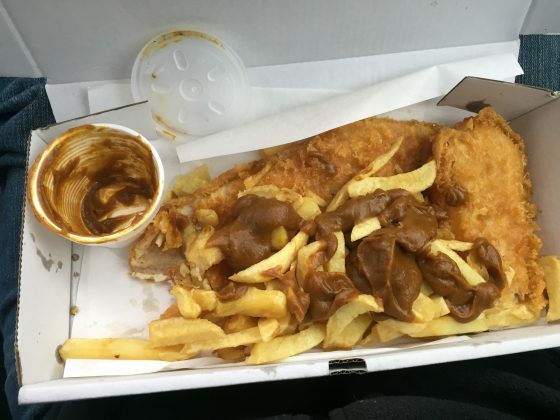 I was skeptical with curry sauce from chippies as it can be very hit or miss. However, you need to take away the fact it looked like something you really wouldn’t want to put on anything, let alone chips. Putting that aside, the sauce itself tasted like curry, I know it seems like I was surprised. I was, we have had so many that have a fruity taste to it with raisins in it, I know right raisins in a curry sauce. 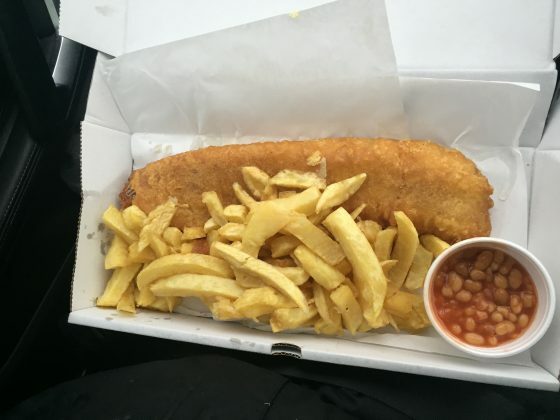 I would go as far as to say this is the best fish and chips either of us had ever had. That’s saying something when you live in Brighton which is littered with chippies all over the place. As with all fish and chip shops, you know your going to be paying a fair whack for the privilege. Here was no different separately you were looking at around £2 for large chips and then £5.60 for a large cod, taking that to just over £15.00 for a fish and chip supper. Little did we notice though that there was a meal deal for 2. Either a medium cod and chips plus a sauce for £10.50 or a large cod and chips with the sauce for £12.00. Saving us probably a good £5.00 doing it this way, you don’t get much in the form of chips. This is more than made up for with the size of the fish, Lees broke, and even this is barely managed to fit in the box provided. As far as chippies go, you certainly do not get better value for money. There was a new chap being shown the ropes when we were there, Jimmy or James I think his name was. It was busy, which is always a great sign for me with a chippy. I was far to engrossed in listening to what appeared to be either the owner, or the manager telling the rookie to put the temperature gauge in the thickest part of the fish as a sign its cooked. The restaurants part itself wasn’t busy at all, which surprised me as the weather was atrocious outside. However, when comparing the price, there was an approximate 20% price inflation for the privilege.